Stacking the two dividend giants up against each other as long-term investment prospects. 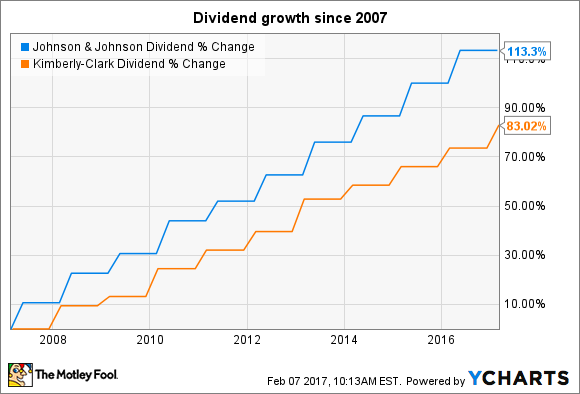 As long-term investments, it's hard not to like dividend giants Kimberly-Clark (NYSE:KMB) and Johnson & Johnson (NYSE:JNJ). They both enjoy prime market positions that deliver unusually strong sales and profit growth. Additionally, they tend to generate market-thumping cash flow and investor returns even in soft growth years, which is why the companies have managed to hike their dividends for more than 40 consecutive years (Kimberly-Clark's streak is 45, while Johnson & Johnson's is 54). But before you buy one stock over the other, here are a few important investment differences to consider. The two companies are on divergent growth trajectories. Johnson & Johnson recently celebrated a return to sales gains as overall revenue rose 3% last year following 2015's 6% decline. Strip out the effects of foreign exchange swings and divested business lines, and the picture remains one of improving demand trends. Organic sales gains sped up to a 7% pace in 2016 from a 4% pace in the prior year. Kimberly-Clark, meanwhile, endured a sharp slowdown that pushed organic growth to a 2% pace from 5% in the prior year. That's roughly the same disappointing growth that Johnson & Johnson managed with its consumer goods segment, but spiking gains in the pharmaceuticals business more than made up for that slack. The success there demonstrates the power of its more diverse revenue streams, which investors have to balance against the fact that a growing reliance on drug sales increases its risk profile. Yet for the coming year at least, there's likely to be another significant growth gap between these two stocks. Kimberly-Clark is projecting a 2% expansion as the consumer goods industry continues to bounce along at near-zero growth. Johnson & Johnson sees its stacked pipeline of drugs helping power organic growth of 6% at the midpoint of guidance. Direct cash returns to shareholders make up a significant portion of total returns for these two stocks. And in both cases, the companies prioritize dividend payments over stock repurchases. Kimberly-Clark has a slight edge on the metric of raw dividend power since its 3.2% yield beats the healthcare giant's 2.8%. But as you might expect given its weaker growth profile, Kimberly-Clark's dividend is ticking up at a slower pace. It rose 5% this year while Johnson & Johnson's latest raise was 7%. Kimberly-Clark is no slouch on earnings growth, though. Cost cuts helped it deliver a surprising boost to profitability over the last 12 months, and management is planning to double down on those initiatives over the coming year. Success there should keep profits churning higher at a mid-single-digit pace even assuming the broader industry goes nowhere in 2016. Investors are paying 19 times the $6.30 per share that Kimberly-Clark is expected to generate in profit this year. That looks pricey compared to Johnson & Johnson's forward P/E of 16. Looking backward, the two companies are valued equally, at about 20 times trailing earnings. As a result, Kimberly-Clark would be attractive for investors looking for a more concentrated bet on the consumer goods industry and a slightly higher dividend yield. But if you're aiming for faster growth that's driven by -- and exposed to -- the volatile drug market, then Johnson & Johnson could be the dividend stock for you.